As the chartered body for treasury we work hard on a number of fronts – policy submissions and consultations, technical updates, and interactions with regulators and legislators to address issues for treasury practitioners and help improve professional standards in the financial sector. We represent the position of the treasury profession to governments, regulators and policy makers and provide the real economy perspective. We monitor developments in regulation, market evolution, technology and the economy which impact on treasury activity and provide informed and unbiased technical advice. 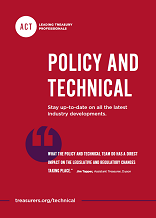 We publish a range of member-only technical updates, guidance and briefing notes on key issues impacting treasury practice. Find out how you can access these resources and many other benefits and become an ACT member. Further resources are available through the Treasurer's Wiki. The ACT has published a number of articles and guides to help treasurers and their businesses with the practical issues they now face over Brexit. The ACT has a range of useful resources covering the reform/replacement of LIBOR for ACT members and treasury practitioners. Useful updates and developments for those in the treasury function. The ACT has contributed to the development of two important codes of conduct in the financial markets that were launched in April/May 2017. Written with business leaders in mind, the 20 issues briefings look at the influence of treasury on financial and business strategy and provide a useful checklist of key treasury questions you should be asking. The ACT responds to The Working Group on Sterling Risk-Free Reference Rates’ proposal to adopt SONIA as the Risk-Free Rate for Sterling and comments on approaches to adoption. The ACT has responded to the HMRC/HMT consultation on the implementation of BEPS: Tax Deductibility of Corporate Interest Expense: consultation on detailed policy design and implementation. Click on the icon below to download the ACT's response. The ACT has argued for single sided reporting (SSR) in EMIR, calling for reporting by Financial Counterparties (FCs) only.